The U.S. economic expansion marches on, as does Oregon’s. Next month marks the eight anniversary since the end of the Great Recession, making the current expansion the third longest since World War II. The good news is nearly all signs point toward continued growth in the near-term. Even so, there do remain significant risks to the outlook, particularly the uncertainty of federal policy. In recent years Oregon’s economy has been among the ten fastest growing states nationwide. That said, Oregon job growth has slowed considerably in recent quarters. While this slowdown has been built into our office’s outlook for years, the severity of the slowing has been more than expected. No longer is the state adding jobs at nearly twice the national rate. Over the course of the 2017-19 biennium, Oregon is expected to continue to see healthy jobs gains – a bit more than 3,000 per month – and enough to keep pace with a growing population. 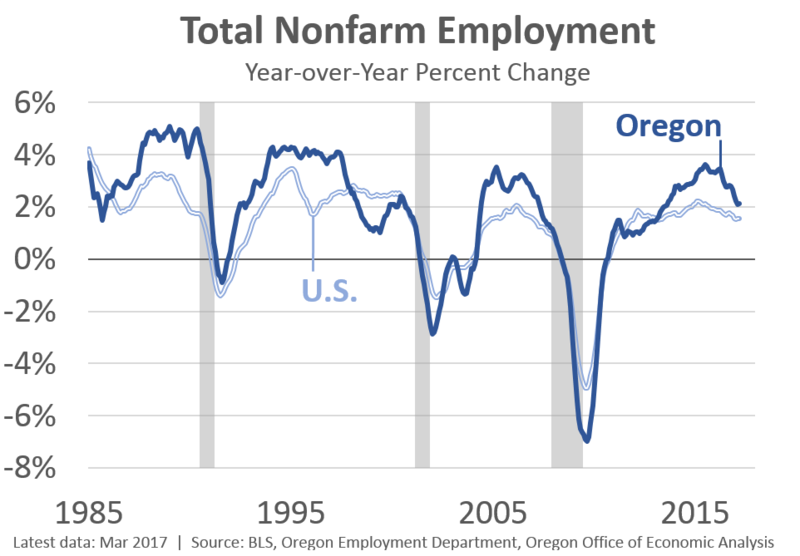 It is quite clear Oregon’s growth has slowed, however, the rest of the economic and revenue data suggest the employment numbers may overstate any weakness. Oregon’s economy is hitting the sweet spot, which only happens at or near full employment. Wages for workers are rising faster. In a tight labor market, firms must cast a wider net to fill openings. As such, job candidates who were previously passed over when unemployment was high are now finding work, this includes middle-aged Oregonians, the long-term unemployed, and the like. Importantly, these factors combine to generate strong household income gains in recent years. As such housing affordability has largely stopped getting worse, and poverty rates and needs-base caseloads are falling. As the peak season for income tax collections winds down, it has become clear that Oregon has enjoyed a good year. Although revenue trends are not as strong as what was seen earlier in the economic expansion, Oregon and its Western neighbors continue to lead the way in terms of revenue growth. A large majority of states are dealing with disappointing revenue growth that has failed to match their budget projections. In Oregon, revenue growth has outstripped expectations, putting our unique kicker law into play. Although revenue growth is still healthy, the slowing pace of Oregon’s expansion has become evident in tax return data just as it is has in the jobs data. Income growth has been cut in half over the past two years, with slowing across a wide range of income types. While still growing for now, business, retirement, investment and labor income have all decelerated rapidly. With increases in the outlook for personal income taxes, estate taxes and lottery sales, net General Fund resources are up $370 million relative to the March forecast. Excluding corporate taxes, General Fund revenues are now 2.4% above the 2015 Close of Session estimate. If this holds through the end of the biennium, an income tax kicker of $408 million would be triggered for tax year 2017. Although the May outlook calls for a personal income tax kicker, it is not a sure thing. Large swings in the forecast between now and the end of June have been commonplace in past years. 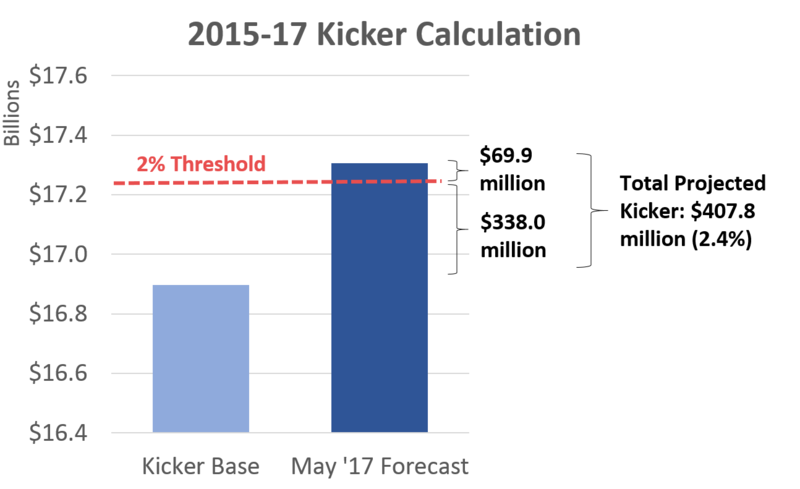 In fact, if revenue forecast errors are distributed on a bell curve, the forecast would be expected to decline by more than the $70 million needed to fall below the kicker threshold in one out of every three years.